There is no doubt that both Ustad Allauddin Khan and Ustad Hafiz Ali Khan, as well as their illustrious sons Ustad Ali Akbar Khan and Ustad Amjad Ali Khan, have dominated the world of sarod for most of this century. Their genius and innovative stylistic contributions have set the standard for modern sarod playing. Yet one should not overlook an extraordinary, though perhaps less famous, artist whose intense dedication and talent keep alive another distinct and important sarod tradition. Sri Buddhadev Das Gupta belongs to a rare category of musician-though fully steeped in tradition he is a genuine Twentieth Century artist. Born in Bihar in 1933, he began his music training at age 11 with the renowned sarod purist Sri Radhika Mohan Maitra. Through his passionate devotion and uncompromising hard work, Buddhadev has emerged as the foremost exponent of the distinctive, complex style his guru created. It is a style distinguished by its wit, its unusual and unpredictable tans, and its masterful incorporation of the bol patterns and vocabulary of the ancient rabab. 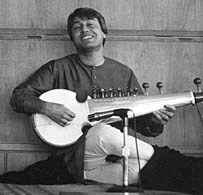 Buddhadev's powerful virtuoso playing, as well as his vast scholarship of sarod history, repertoire and technique, has earned his place among today's leading sarod masters. He has performed at all of India's major music conferences, broadcasts regularly on All-India Radio and is a member of the Sangeet Research Academy's Empirical Research Wing and Committee of Experts. Buddhadev's musical achievements are all the more amazing when one considers that he also had a brilliant academic career and served for more than 20 years as a thermal power engineer for the Calcutta Electric Supply Corporation. He retired from that highly responsible position in May 1988 in order to focus his energy even more intently into his music. Buddhadev Das Gupta was born in Bihar in 1933. He began his music training at eleven with the renowned purist, Sri Radhika Mohan Maitra. Buddhadev has emerged as the foremost exponent of the distinctive, complex style his guru created. It is a style distinguished by its wit, its unusual and unpredictable tans (cascades of notes), and its masterful incorporation of the bol (rhythmic stroke) patterns and vocabulary of the ancient rabab. Buddhadev's powerful virtuoso playing, as well as his vast scholarship of sarod history, repertoire and technique, has earned his place among today's leading sarod masters. 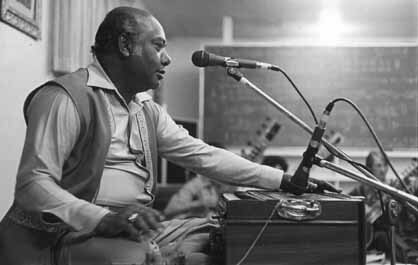 Anand Gopal Bandopadhyay is from a family of musicians of the Vishnupur Gharana of West Bengal. Receiving his initial training from his father, he became the disciple of Pandit Mahadeo Prasad Mishra of the Benares Gharana. Rag Nayak ki Kanra is an old rag of the Kanra family. Rags of this type are related to the Sarang scale types, and have a flat third (komal ga) and seventh (komal ni). Most of them show the common cadential movement ga-ma-re-sa. In Nayak ki Kanra, the note motion re-pa is a further identifiable characteristic, as is the ascending figure, re-ma-pa-ni-pa. The recording begins with a masterfully-measured alap and jor, in which the tonal color and phrases of the rag are individually introduced and developed. The gat in tintal (where the drummer enters) brings in the important phrase re-pa in its approach to the downbeat, and features virtuosic tans (melodic patterns) in the further development of the rag. These are brought to rhythmic life through the use of intricate tight-hand plucking patterns (bols). This performance is a tour-de-force by one of the India's greatest modern sarod players, who brings out the rich lustre of the tradition of his gharana. Credits: Recorded at the home of Dr. and Mrs. Malaviya in Fishkill, New York. Nakamichi DMP-100 processor. Photos p. 3, 7, 10 collection Sangeet Natak Akademi. Special thanks to George Ruckert, John Campana, Subrata Chowdhury, and to NVI for digital studio facilities. Audiofile Engineer: Andy Green. Associate Producer: Ira Landgarten. Produced by John Wilton.